President Xi Jinping is not attending Davos this year – he sent China’s economic mastermind instead. And although Liu He is no stranger to the annual gathering of the world’s business and political elite, he has not previously been the one giving the speech. 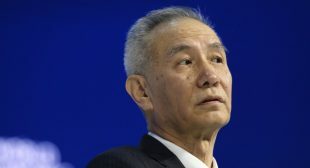 On Wednesday, Liu – who is a strong candidate to take charge of the country’s economy for the next five years – told the world’s rich and powerful in the Swiss resort town that China would open its domestic markets wider and that this year’s reform measures could “exceed the international community’s expectations”.